Hypocrisy is the contrivance of a false appearance of virtue or goodness, while concealing real character or inclinations, especially with respect to religious and moral beliefs; hence in a general sense, hypocrisy may involve dissimulation, pretense, or a sham. Hypocrisy is the practice of engaging in the same behavior or activity for which one criticizes another. In moral psychology, it is the failure to follow one’s own expressed moral rules and principles. This year there are at least three U-turns that Francis has made on crucial questions, but always without making it clear if these are definitive and sincere, seeing what he has said and done before and after the apparent reversals. The first U-turn has been activated against the ordination of women to the priesthood. 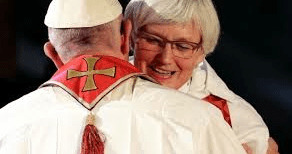 Here, properly speaking, Jorge Mario Bergoglio has not contradicted himself, because every time he has been asked since becoming pope he has always said he is against it personally, for example after his voyage to Sweden, where he had however embraced a female Lutheran bishop (see photo). But at the same time he has long allowed the favorable opinions to run free, also on the part of figures on friendly terms with him, like cardinal of Vienna Christoph Schönborn. Ladaria enjoys the esteem of Francis, who a few days ago also made him a cardinal. It must be said, however, that the supporters of women priests have not given up, because meanwhile Francis has set up a commission to study the ordination of women not to the priesthood but to the diaconate, which is however still a sacrament and is the first of the three steps that culminate in ordination as bishop. To judge by the preparatory document of the synod for the Amazon, scheduled for 2019, it is projected that this same region will see the ordination of the first women deacons. And then who knows. The second U-turn has been activated against communion being given also to Protestant spouses who are married to Catholics. When asked about this very question three years ago, while he was visiting the Lutheran church in Rome, Pope Francis leaned heavily toward the favorable side. And in Germany, where mixed couples are numerous, this new practice has spread to such an extent that last February a majority of the German bishops approved a documentthat justifies it. The third and most striking U-turn, that made by Pope Francis against the bishops of Chile – one in particular, Juan de la Cruz Barros Madrid – complicit in the sexual abuse committed by the priest who was their teacher when they were young, Fernando Karadima, tried and convicted by the congregation for the doctrine of the faith in 2011. Until a few months ago, Francis had been saying that he was absolutely sure of the innocence of these bishops, and defended them with drawn sword against those who were “calumniating” them. But then the 2400 pages of the canonical investigation that he finally ordered led him to confess that he had been spectacularly mistaken “through the lack of reliable and balanced information.” Whose fault was that? Most of the suspicion has fallen on Cardinal Francisco J. Errázuriz, a longtime friend of Bergooglio. But at the origin of the deception is above all a Jesuit, Germán Arana, who shuttles between Rome, Spain, and Chile, and continues to belong, even after the blunder, to the most intimate circle of the pope’s confidants. It is in this circle of his allies that Francis’s weak spot is to be found. And seeing what has gone before, it appears altogether unlikely that in the future he will make a real U-turn precisely here, with a drastic housecleaning. This commentary was published in “L’Espresso” no. 26 of 2018 on newsstands July 1, on the opinion page entitled “Settimo Cielo” entrusted to Sandro Magister.